Haha actually it was always supposed to be Clairvoyant and as a joke they released 250 under the name Unicorn Puke because someone told Maria at Cult Nails that it looked like Unicorn Puke! I actually have one named Unicorn Puke and it so funny! I love it over Zoya Kelly, it looks fab on you! You're Right She only made 350 (I think)of Uincorn Puke and they sold out very quickly, then someone posted on e-bay for a high price. She made Clairvoyant which is a dupe, so more ppl could get their hands on it. I thought it was named Unicorn Puke as a play on "Unicorn Pee" because thats what everyone calls Clairns 230. But I'm not 100% sure of that. Geez I'm rambling! I love the way it looks and I'm sad I missed it. 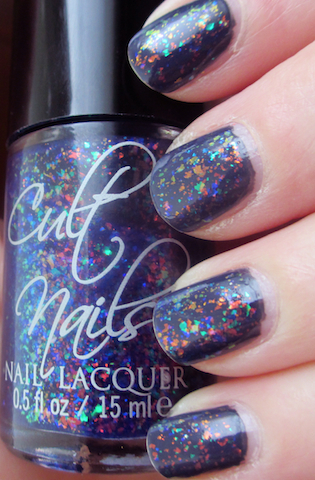 This is one polish that I really do wish I owned. By the time I really got into polish, this one was already gone! Hopefully one day she'll be able to re-create it again! Yes, hopefully she will:) If you lived closer to me, I would give you some! I always forget to wear this too - I am wearing all kinds of different polishes now that I am doing this blog! And thanks for nominating me for the Versatile Blogger Award - it was very kind of you:) Good luck with your nursing ambition!